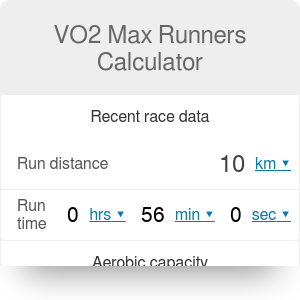 VO2 max runners calculator - how to use it? VO2 max runners calculator is dedicated for all the runners and other athletes who want to check their personal maximal oxygen consumption. Knowing this critical parameter is essential for every endurance sports competitor to train consciously and effectively. We prepared an article for you, where you can find some brief information about what is VO2 max, highest VO2 max rates, and a short calculator instruction for the users. Use our calculator and find your VO2 max value in seconds! VO2 max stands for maximal oxygen consumption or maximal aerobic capacity and refers to the amount of oxygen your body is capable of utilizing in one minute. It is one of the most popular indicators of physical efficiency, especially aerobic efficiency. It is a measure of your capacity for aerobic work and can be a predictor of your potential as an endurance athlete or even of future health. Usually, athletes and trainers use the percentage value of VO2 max to express the intensity of training. The V02 value rises significantly in teenagers (both males & females) to achieve maximal levels in age 18-20. Later in adolescence they gradually decrease. The most reliable way to find your VO2max is to have it done in a lab or gym, but you can also estimate it. There are a few proven methods that allow it. For runners, the most suitable method is Jack Daniel's formula. Based on it, you can estimate your parameters from a recent running race. Daniels formula assumes that to achieve reliable calculations, the race distance should be between about 1500 m and 50 km (about 1 mile and a marathon). Distances outside this range will not give meaningful results since performance is limited by factors other than VO2 max. where time is the race time, and velocity is race velocity in meters / minute. Data are based on "Essentials of Exercise Physiology, 3rd ed., W. D. McArdle, F.I. Katch, V. L. Katch, Lippincott Williams and Wilkins, Philadelphia, PA USA 2006". Professional athletes are able to achieve very high VO2 levels - especially those who compete in endurance disciplines like running, cycling or cross-country skiing. Such high numbers are out of range for most of us - amateur sportsman. For sure, many years of tough training stimulates an organism to achieve better results, but, as mentioned above, natural predispositions matter a lot. Take a look at the list below with a few V02 record holders. VO2 Max Runners Calculator can be embedded on your website to enrich the content you wrote and make it easier for your visitors to understand your message.